Different shades of yellow can help you create an upbeat and uplifting atmosphere, and add some sunshine to your home. Considering yellow walls? There are probably more shades of yellow than any other color. Ranging from delicate primrose to uncompromising cadmium, every shade is infused with life! But yellow paint color intensifies drastically when used on the walls - more so than most other hues. And while a tiny paint chip may look sunny and cheerful, the overall effect can turn out rather overwhelming in reality. Interior decorators even have a joke about this - "Every can of yellow paint should come with Caution: Handle With Care!" The fact is, your chosen yellow can often disappoint on the walls - that's why it's so important to test it first, using large sample boards. 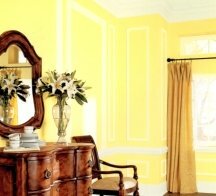 But, while difficult to work with, yellow walls can be so rewarding when you get the color right! Saffron, cadmium, lemon yellow - these shades are not shy about shouting their presence, much like red! But unlike red, their excitement is festive and cheerful, rather than bold and energetic. They are also bright - not just purely stimulating. For this reason these vivid hues are very difficult for the eye to process and see. In fact, they are the least popular on the spectrum. Some real estate agents even advise homesellers against bright yellow walls, because this color can often lower the perceived value of a house. Acid yellows are not restful in bedrooms and other relaxing areas. Plus, they reflect poorly on the skin, making people look as though they are suffering from jaundice - pretty much ruling them out as a good choice in powder rooms and bathrooms. But where do you use these saturated shades then? 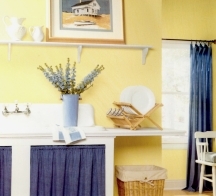 Hallways, rooms without windows, utility rooms, laundry rooms, closets and other dark spaces can really benefit from the added brilliance of strong yellows. These highly reflective shades appear even brighter than white, so use them wherever you want to bring in some light. In the North, bold yellows can take away the grayness present in the natural light, and warm up a space. In already well lit rooms, bright yellows are best saved for painting a statement wall, an alcove or as home decor accents. 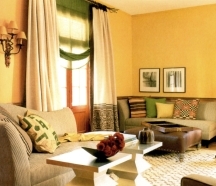 And in hot, southern climates, it's better to opt for a cooler, yellow-green color (think more of a chartreuse). 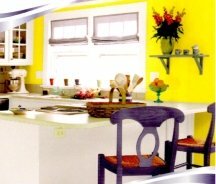 Most popular in contemporary urban settings, kitchens and other rooms with bustling activity, acid yellows look crisp with white woodwork, and lively with touches of pure/clean pink, purple, red and green. 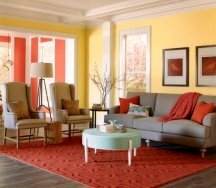 TIP: if you made a mistake and painted your entire room a yellow that is too strong, you can draw attention away from the crazy yellow walls and ground the color with the help of dark furniture, bright-colored fabrics and dramatic wall art. 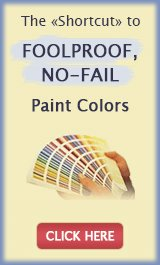 Or just avoid mistakes altogether by using the Paint Color Cheat Sheets that give you 8 best shades of yellow that always work. But of course, there are also more approachable and livable yellow shades - such as butter, pale ocher, camel and muted gold. Even when the color of your yellow walls is barely noticeable, it will still look welcoming and provide a natural warmth to a space. Pleasant and peaceful, these are the most successful shades to work with. Because they are not trendy, they never go out of vogue, and can be tailored to any decorating style. For example, they will look contemporary when paired with oranges and purples. Or, to create a timeless English look, combine them with greens, reds and blues. 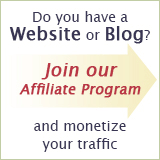 But in general, virtually any color will look good against soft, muted yellow walls. These pleasant shades often form the basis of a neutral, but more interesting room color scheme, and can emphasize stained wood finishes like maroon brown, mahogany and chestnut. Pale, faded shades of yellow can also be leveraged by adding a few bright yellow accents to the decor - the result will be "sunshine by osmosis". TIP: in order to make pale yellow walls work in poorly lit, somber spaces, you will need to crank up the intensity of the color - otherwise your creamy yellow will look like a sickly shade in the lack of natural light. 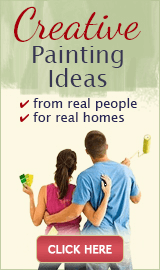 Want more ideas and inspiration for painting yellow walls? Here's how other people have used yellow paint in their homes - take a look at these photos and stories submitted by our readers. And if you have your own yellow room painting project to share, click here and see your name in lights! My Yellow Painting Idea for Kitchen Walls - "Antique Gold"